SINGAPORE'S third and newest medical school welcomed a larger cohort this year, as it ramped up intake to help meet the health-care demands of a rapidly ageing population. Nanyang Technological University (NTU) admitted 78 medical students this year, up from last year's pioneer batch of 54 students. Professor James Best, dean of the Lee Kong Chian School of Medicine, said the school would keep growing until it reaches a yearly intake of 150 students within four years. When the school opened last year, Singapore's total medical intake climbed 17 per cent to 413, closer to the Ministry of Health's (MOH) target intake of 500. MOH has projected that Singapore needs to add 20,000 more health-care professionals between 2011 and 2020, an increase of 50 per cent, to meet the population's growing demands. Competition for places at NTU was keen this year, with more than 800 applications submitted. Just 330 applicants were short-listed for interviews and 78 made the cut. Most had scored three As or more at the A levels, or had near perfect International Baccalaureate scores. All 78 are Singaporeans. "When we have only 78 students, Singapore comes first at this stage," explained Prof Best. "Singapore is importing a lot of doctors, and their challenges are that they don't understand the health system, and there can also be difficulties in communication." 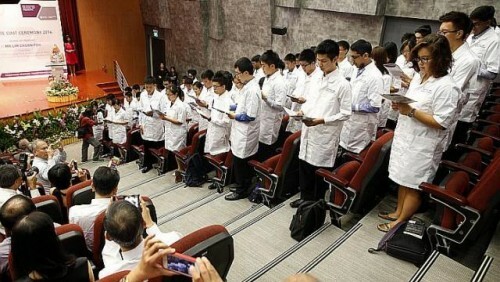 At a ceremony held at NTU yesterday, the dean conferred white coats on the incoming class. Among them was Mr Ishwarpal Singh Grewal, a national hockey player who chose NTU over Imperial College London to study medicine. "I ultimately want to work in the Singapore health-care system, so the benefit of studying here is that I get exposed to the clinical settings and environments here," said the 20-year-old. "And the cost was a factor as well." Mr Grewal will pay an annual tuition fee of $31,500 as a Singapore citizen, less than half the amount he would have to pay in London. The school also welcomed its first polytechnic graduate yesterday, who scored a near-perfect GPA from Singapore Polytechnic. "I'm very excited," said Mr Russell Chuah, 21. "I feel that medicine will be a very noble profession."